We are a reliable, fast and value-oriented General Contractor and Construction Managers. Our experience has given us the tools to provide construction solutions to a variety of different projects, both large and small. Our services are customer focused and we strive to understand the needs of our customers. Since our inception, G.T. McDonald’s beachfront and inland projects, from Jacksonville to Miami Beach, have sustained turbulent hurricane seasons without failure or water intrusion. The Company also has extensive experience with historic restoration and renovation projects of Oceanfront and Bayfront properties. Hospitality companies, steady government and school contracts have provided a well-rounded business base. Our team has wide-ranging knowledge of the construction industry which includes an outstanding Project Management staff and a highly efficient office team overseeing subcontractors, accounting, insurance and bonds. 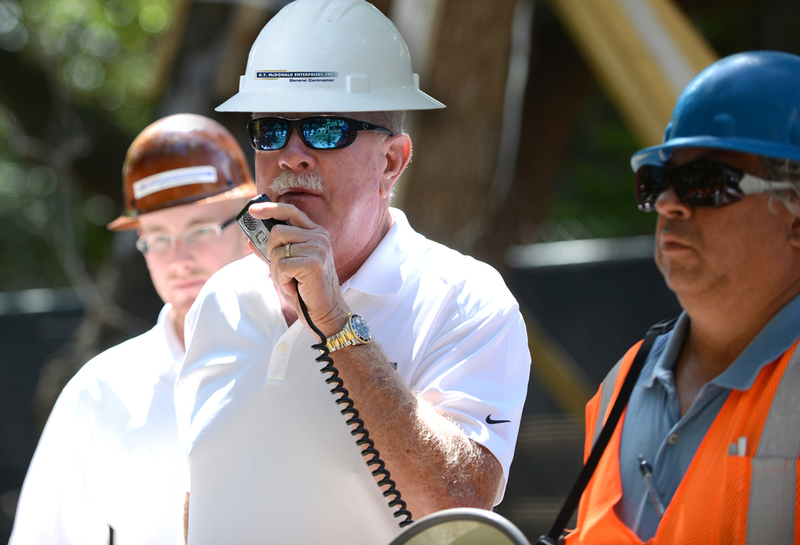 Company President, Jerry McDonald, personally manages construction, executes contracts, and negotiates subcontractor agreements. A manageable annual volume has assured the company steady growth while allowing a hands-on management style not available at larger firms. Our computerize scheduling and construction software provides our client managers and our clients with information necessary to identify potential obstacles, so that these may not interfere with the project. Computerized accounting and management allows for accurate cost accounting regularly for our construction management projects, so clients know exactly their cash flow requirements. At G.T. McDonald Enterprises, our bonding experience, risk-management and insurance coverage provides our clients with the security that their projects are well protected and managed. Our Team of project managers, superintendents and office personnel are committed individuals who deliver rather than promise. All G.T. McDonald project engineers have earned either a Bachelor of Science degree or Master’s Degree in Structural Engineering or Construction Management. In order to assist our clients, our Company is structured with four levels of organization; the Pre- Construction Team, Construction Team and Structural/Finish Team, Start-Up Operations & Warranty, and Financial & Risk Management. This process begins with purchasing and subcontractor selection. G.T. McDonald utilizes a pool of subcontractors and suppliers known for their experience and record of excellence. The Company also has a policy to pre-qualify every subcontractor and supplier used on the project. We use enclosure consultants, independent engineering firms, special inspectors and architectural firms who provide a timely review of plans, submittals and construction inspections, beginning with submittal review. All exterior items such as waterproofing, roofing and windows/glazing, are independently tested and inspected by consultants prior to closing any area to determine that they are watertight and meet wind load requirements (i.e. windows are tested and inspected after installation and prior to drywall placement). Roof systems are purchased with a minimum warranty of 20 years and with an unrestricted dollar amount from an approved applicator and manufacturer. Enclosure consultants work with the manufacturer’s representatives to inspect the work in progress. Final reports are issued by both groups when the work is completed. These systems are all inspected prior to installation of drywall by independent firms providing written reports and photo documentation that the installation is done correctly. Where work needs correction, re-inspections are provided and all deficient items are noted as corrected prior to drywall installation. Special inspectors approved by the City of Miami Beach and hired by the Owner, inspect and approve all structural installations. We recommend that the inspector should also be a structural engineer licensed by the State of Florida. Products are selected for the necessary warranties and longevity they provide. All products used in the project are required to have consultant’s approval prior to installation of the system.